Some new people wanted to join the Footpaths Group, others expressed specific concerns, particularly about a new Sawpit Lane/Longcause/Barracks Hill path. The Group has so far operated mainly as an email discussion group , making suggestions and comments,with the opportunity to meet at community workshops etc. Group members can thereby ,with little effort ,contribute to the Community consultation requirement which is the main spring of the Neighbourhood Planning process. The NP process, even in its embryonic phase, can importantly influence current planning decisions. The NP F.Path Group has been asked to comment on the hugely controversial Brimhay and Webbers Yard development (bigger development than Cavannah Homes,”Origins”) now nearing the end of its consultation window. I attach a draft letter of representation for your comment and hopefully approval,by Friday. If you approve it will be submitted to the NPSteering Committee on 30th March for their endorsement.The Open Spaces and Housing NP Groups have submitted their separate representations. The Footpaths Masterplan has been further updated to include the comments made at the workshop and the DHT response to my queries of 25th Feb.. There will be a NP Community Consultation event at Dartington Primary School tomorrow afternoon(Weds),with a view to involving children and parents.If you wish to see the updated Masterplan and/or wish to meet up to discuss anything do come along! Jo and John of the DHT, who have been most supportive and have been instigating lots of new paths on the Estate. They have suggested that a hands on working party might like to be involved with clearing two of the new woodland paths which this Group has suggested, and they have agreed; namely Yarner Hill and Nellies Wood? Please let me know if you would like to be involved. Many people have expressed concern about the important issue of having a Hunters Moon to Kingsbridge Hill path(ie Sawpit/Longcause/Barracks).Unfortunately I don`t have the time to research this.If this matter is to be tackled would it warrant setting up a task sub group specifically examining the options available? Some of you, I know, are already exploring possible routes.The issue of a path alongside Barracks Hill has already been tackled.There is a possible route just within the Kevics boundary wall,and the Board of Governors have agreed in principle.Please let me know if you would like to be involved in such a task sub group? 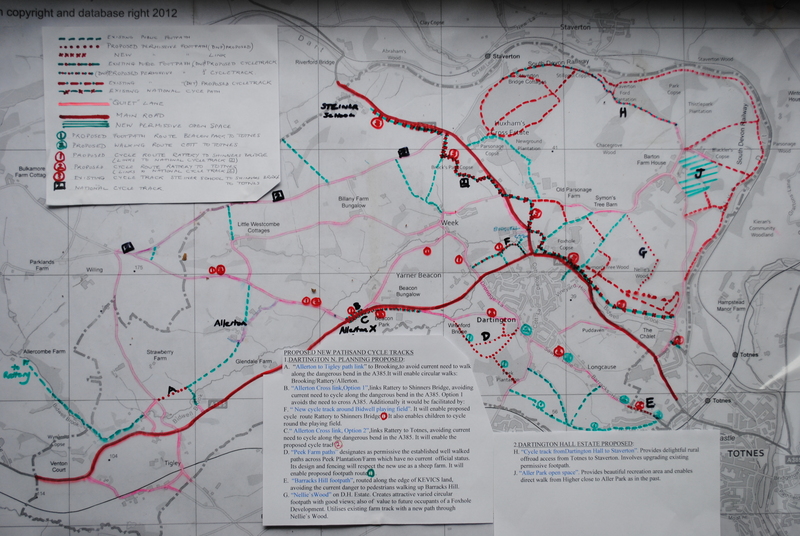 Here is my attempt to show all the existing and proposed Dartington paths on a single A1 size map,a draft “master plan”.This has been based on your and other local resident suggestions, as well as on my recent meeting with Jo Talling and John Channon of Dartington Hall Trust.There has been no response to the appeal for suggestions in” Our Dartington”. The next stage is to obtain your comments on the proposals,before the serious business of developing these proposals.Your Comments are an essential ingredient in the Community consultation.We could have a meeting ,however meetings so far have been poorly attended,and I would guess particularily so at this time of year.So I`m hoping that the attached map will be adequately comprehensible to enable an email dialogue? The map is in photo format,so should open in photo gallery where, to study the details,you will be able to zoom in to any part of the map( otherwise open in photo gallery). Please indicate where clarification is needed of any details. I`m keen to make immediate progress on these proposals so your urgent response,however brief ,would be much appreciated. I`ve attached a list of explanations of the proposals both superimposed on the map and separately (in greater detail ) for ease of reading. Submit the master plan,updated with your comments to the Steering Committee for approval at next meeting on Jan 5th.So comments needed by 3rd Jan please. Send the master plan to all interested parties, such as Ramblers,Totnes on the Move etc .Incorporate their responses in time for submission of updated master plan to Steering committee for approval on 26th Jan.
at the Community “envisioning” workshop on 28th Feb present the progress to date, and seek Community approval/comments. How can we reinforce the Access Only for cars on Cott Road, Longcause and Barracks Hill. 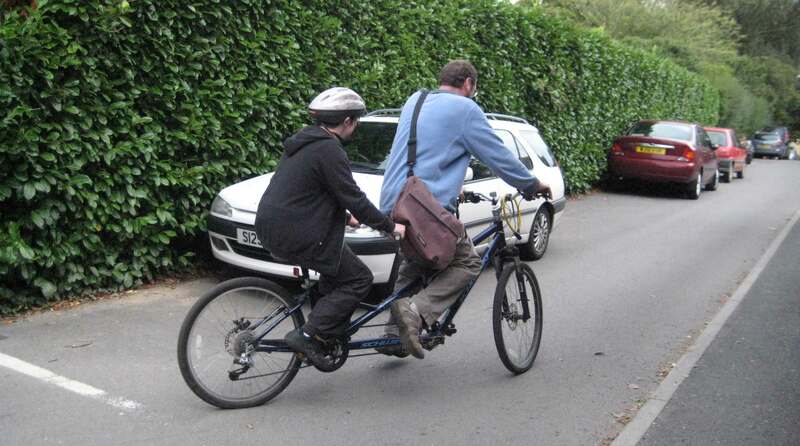 Volume of traffic is getting to dangerous levels for pedestrians and cyclists.